In August 2012 I was invited to China to represent the American Association of Woodturners (AAW) at a symposium organised by the International Wood Culture Society (IWCS). I had always wanted to know about Chinese turning, so I looked forward to finding out about it. To my surprise, I could find no evidence of woodturning and everybody seemed to find my demonstrations amazing, because they had never seen turning before. Determined to find out more, I asked Su Jinling, the General Secretary of IWCS, to help me track down some traditional turners. Eventually she was able to find a few villages where the old ways were still known, and since then we have visited two villages where the ancient traditions still cling to survival. In November 2013 we travelled to Yangji Tun village on the Yellow River, about 550 kilometres south of Beijing. There we met Wang Xuejun, who is now 53, and his father, Wang Minde, who is 84 years old and has retired from turning. 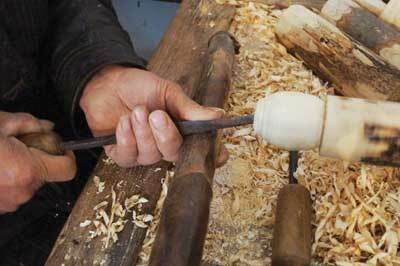 We learned that in the past there were dozens of lathes in the village, used by many families for making wooden toys. However, the demand for these toys gradually faded and now the only one left still making these traditional turnings is Wang Xuejun. The turners of this village used to make around 20 different items, from toys to lucky charms, and some utilitarian objects. They included brightly coloured wooden dolls with moving heads, balls, mallets, sewing boxes, pins, and coloured eggs that were hollow, and rattled when shaken. Cosmetic containers were made for young women to put powder and rouge in, while other containers were made to hold captured crickets. Some of the goods were even made to be included in a young woman's dowry when she married. Wang Xuejun explained that making these goods is very labour intensive: "The process for making turned wooden toys is complicated," he said. "You have to go through wood selection, cutting, storage, drying, cutting into blanks, trimming, turning, assembling and painting. It's more than 10 stages. The tools include the pedal lathe, medium and small saws, axes, adzes, hammers, gouges, drills, large cutting tools, awls and brushes." 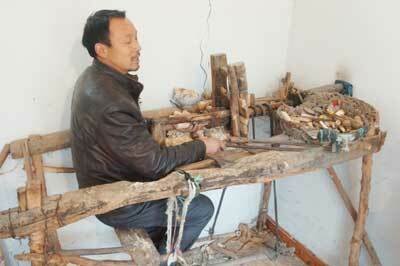 Wang Xuejun told us some more of how important turning used to be in the village. "Up to the 1980s, turned wooden toys were very popular at festivals. Villagers turned all year long and the toys piled up like mountains. Every family turned wooden toys all year round. Besides selling them at the County temple festival, they pulled wagons full of toys to regional cities to sell, some of them quite far away. They were better turners then and were able to sell everything they took with them," he explained. 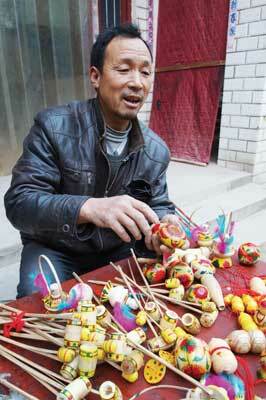 Once cheap plastic goods started to appear, the prices of handmade products were too high. The sales of turned wooden items declined and the turners in the village started finding new jobs. 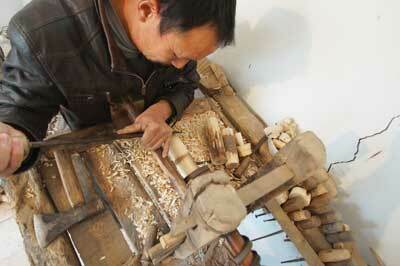 Sadly, as with many traditional practices, this ancient craft is facing extinction in China. 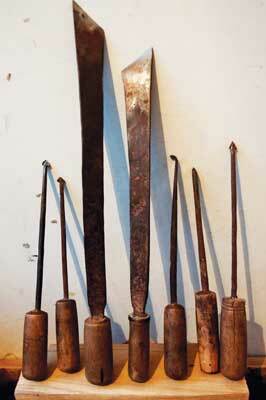 Again, Wang Xuejun explained: "No one makes tools like gouges and hook tools now, so they are hard to come by. Also, it is not so easy to get the right wood any more. 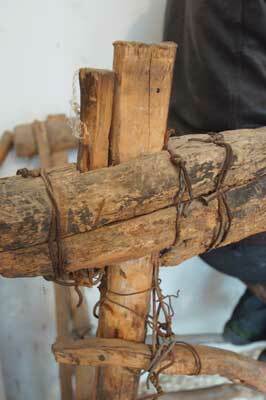 We used to make the wooden toys from willow (Salix spp. ), because other woods don't work so well. Several families would share the cost of a whole willow tree, but big willows are hard to come by now." 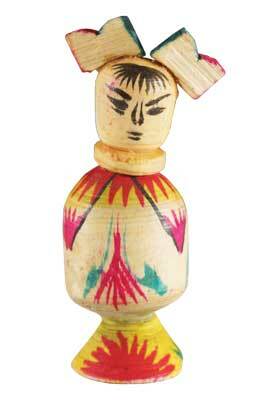 Wang Xuejun's wife, Gao Yongu, told us that the traditional patterns painted on the wooden toys have been used since ancient times. Usually they used yellow and white as base colors and then painted the patterns with bright colours like red, green and blue. "In the past, the stains were made from ash and limestone powder. Now we use modern dyes and fix them with egg yolk," she said. 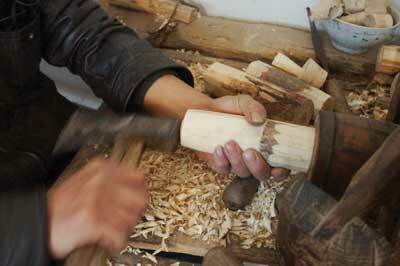 Wang Xuejun told us that he started woodturning when he was a teenager. Although he stopped turning for many years after demand declined, he recently started again. He wanted to show us his lathe, so he took us to a small storeroom at the side of his house. "This is the pedal lathe used for making toys," he said. 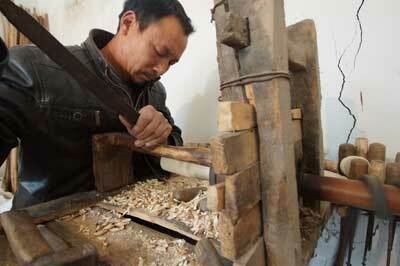 "This kind of lathe has been passed down for many generations, starting in the early Qing dynasty." 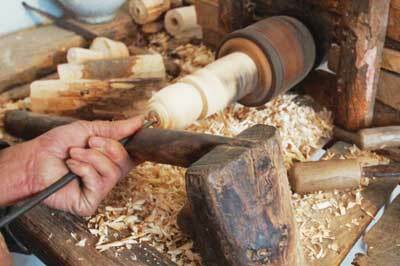 That would mean such lathes have been around since the mid-1600s. The lathe is a rough rectangular frame that the turner sits inside. It is driven by two pedals, in line with the axis of the lathe. The power is transmitted to the shaft via a belt. In the past this used to be made of leather, but now a rubberised V-belt does the job. Clearly sentiment has no place in keeping this craft alive, as traditional construction techniques have been sacrificed for convenience. The seat is now suspended by recycled plastic rope, and the frame is held together with a mixture of wire, nails and rope. The shaft is held in a headstock made of planks, wedged between uprights, and there is a groove in the shaft that runs in a cut-out in these planks. The only metal part is a ring that reinforces the jam-fit chuck that the turner faces end-on. Mr. Wang showed us how he hammers a blank into the chuck with a combination hammer/hatchet that is used to rough out the blanks. 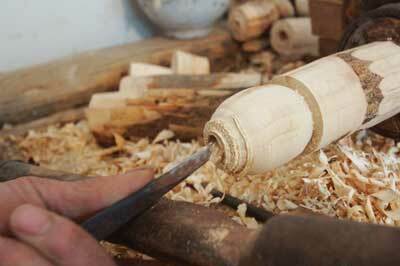 The toolrest is a length of hard branch, with a 'foot' attached at one end. At this stage, one end of the toolrest sits on the headstock, creating a level support so Mr. Wang can cut the blank to round. Mr. Wang used a skew chisel, cutting on the left of the blank, so the cutting stroke was powered by his right foot. "You have to use both hands and feet when you use the pedal lathe," he explained, "so it takes a lot of skill to control the tool." He was able to look directly down onto the work, but it left me with no way to photograph what he was doing, as the cutting edge was completely obscured by the toolrest and his hand. By climbing on the wobbly lathe, I was able to glimpse how he was controlling the tool, just as he started rolling the tool to round over the end of the blank. 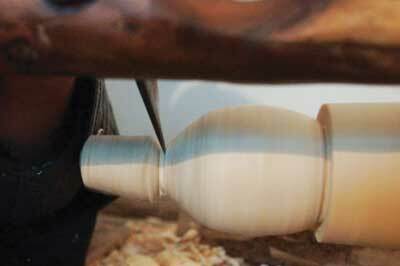 When he had partly roughed out an egg shape, he moved the toolrest so it was at 90° to the end of the shaft. This meant the toolrest was now angled so he could position the tool dead-centre to the blank. The toolrest is only held in place by downward pressure from his hand. I didn't know what Mr. Wang was going to make, so what he did next truly amazed me. 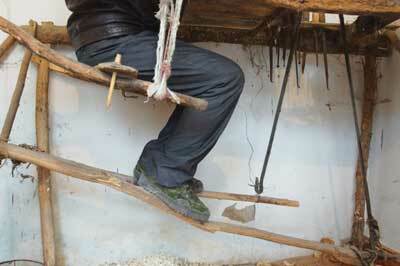 He first bored out the centre using a kind of spear-tip tool, then hollowed it using a small hook tool. Mr. Wang was making a hollow vessel, but using a technique that he says has been used in China for hundreds of years! There is truly nothing new under the sun. When I looked more closely I could see that he was using an underhand grip that is exactly like the grip used by traditional Western spindle turners. Who knows who did it first? Did such techniques develop independently on opposite sides of the globe, or was there some kind of Silk Road exchange, that spread the idea in one direction or the other? This kind of question goes to the very heart of what I was trying to find out in China. 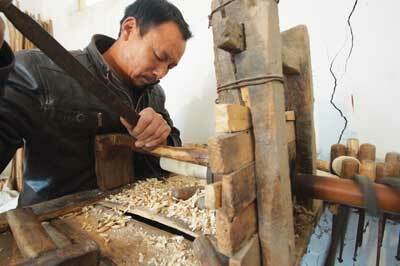 When he had hollowed the piece, Mr. Wang placed a few pebbles inside, and then hammered a pre-cut plug into the hole. Interestingly, he didn't use the hammer this time, but hit the plug with the heavy foot of the toolrest. Finally, he used the skew chisel again to round over the protruding plug, and then part off the finished egg from the lathe. Mr. Wang held it up proudly and shook it, so it loudly rattled: "When it is painted, this will be a 'five colour egg'. They used to be given at weddings and other celebrations, and they brought good luck." He smiled broadly: "I can still make dozens of these every day," he said. Later we sat outside his workshop and Mr. Wang showed us some of his brightly coloured finished products. A pair of tiny dolls that Mr. Wang showed me had a charming quality, and I could see how, in a simpler world, they would have appealed to children with no access to the modern toys we are so familiar with. As he explained each piece, I asked why he still makes them if there is no market for such work: "That's easy," he said, "we have been encouraged by the local government to do this because it rates our work as an important cultural heritage. It's called 'Henan Provincial Non-material Cultural Heritage for Development'." Mr. Wang has been designated as a representative heir of this tradition and he receives a small financial incentive from the local government to continue turning. "So I am turning again," he says, "and I will continue to do it. It is part of our culture, regardless of whether we earn money for it or not. 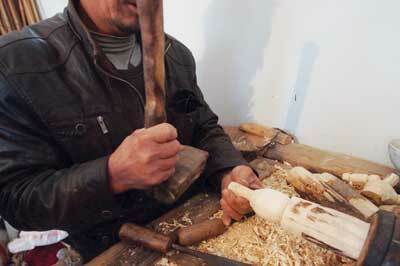 There are still other lathes in the village, but they are all broken and only my lathe is still functional." He paused, then sadly added, "We can't just throw away the craftsmanship passed down by our ancestors." The elder Wang Minde has gone on the record as saying that turning has been carried out in his area for around 3,400 years. He says his ancestors first made a living turning shuttles for weaving machines then, inspired by clay toys, they started turning wooden toys using the same techniques. A regional cultural expert, Ni Baocheng, has published a claim that turning has been done in China for 5,000 years. I am searching for ways to verify this claim and if I can, I think we are all going to have to rethink everything we thought we knew about the history of turning. It is such a privilege to be able to find out these things first-hand. I owe enormous thanks to Su Jinling and to the International Wood Culture Society, and I urge readers to visit their website and learn more about their amazing work. See details opposite. For many years I have researched and written about Japanese woodturning, and have written several articles for Woodturning magazine on the subject. I have always tried to find out more about the origins of Japanese turning but have never been able to find anything beyond around 1,300 years ago. I've always suspected that Japanese woodturning, like carpentry and architecture, may have been influenced by China, via Korea, but I've never been able to find direct evidence for that idea, beyond certain similarities of style and technique. 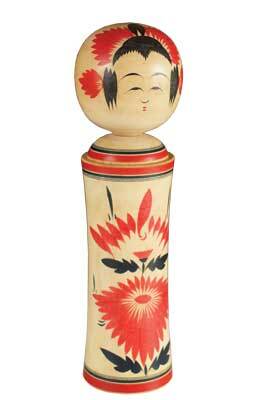 Japanese turners themselves are silent on the subject, but that is not surprising. As craft and trade techniques in Japan have been strongly guarded secrets for hundreds of years, ancient roots may have been buried under layers of professional secrecy. But, my visits to China have confirmed that there has clearly been an exchange of expertise. The end-on working position, sloping movable toolrest, hook tools and many more things, can be found in different permutations in much Japanese turning. The thing that astonished me the most was the similarities in products that are made in the Western world. In the November 2000 issue of Woodturning, I wrote about traditional Japanese kokeshi dolls, made in the village of Naruko. I explained how the heads of the dolls were movable because they were separately turned and added later. The local turners had built a legend around these dolls. Because the heads squeaked when they were rotated, they called them 'crying dolls', and claimed they represented the spirits of stillborn babies. I went on to describe how they painted their dolls with 'the distinctive patterns that identify the dolls as Naruko work'. What could be more Japanese? Now, nearly 14 years later, all my preconceptions were being dismantled. If we compare the dolls Mr. Wang makes with the Naruko kokeshi, the similarities go far beyond coincidence. Firstly, the heads on Mr. Wang's dolls rotate. They are turned separately but, most tellingly, they are inserted into the body of the doll by pushing a slightly oversized neck nub into a hole while the lathe is rotating. It pops in when it heats, and expands the hole in the body, and when the hole cools and contracts, it cannot be removed. This is exactly how the Japanese do it. Secondly, one look at the two different dolls confirms that there is some ancestral link. Although the Chinese doll, painted by Mr. Wang's wife, is much less sophisticated, the similarities are astonishing. The fringe on both dolls' foreheads, the simply brushed eyes and eyebrows and, most tellingly, the colours and flaring patterns of the decoration all speak of strong ties. I am in no doubt they are distant cousins. Keep in mind that Naruko in Japan is a mountain village that until the 20th-century would have been very difficult to access. Yangji Tun village in China remains a very obscure place, hard to find if you do not have a knowledgeable guide. The connection is probably very old and must have been very convoluted indeed to link these remote places around 2,500 kilometres apart. What is amazing is that the link was still there to be discovered. What other secrets of turning history have I yet to uncover? I will be returning to China soon to continue my research.